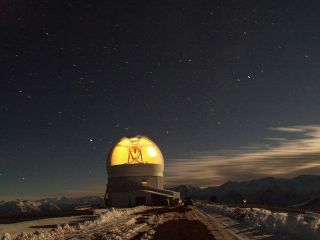 A time exposure view of the SOAR telescope observing at Cerro Pachon in Chile. This article was updated on May 15 at 4:02 p.m. ET. A powerful new ultraviolet laser that fires into the night sky is helping scientists take their most detailed look yet at a distant star cluster. A team of astronomers at the Southern Astrophysical Research (SOAR) telescope and the Cerro Tololo Inter-American Observatory (CTIO) in Chile used an instrument called SOAR Adaptive Module, or simply SAM, to peer deep inside the crowded NGC 6496 cluster to understand how its stars evolved. The study also suggests that NGC 6496’s stars have a much higher proportion of elements heavier than hydrogen and helium than most clusters of its kind. The research will be detailed in an upcoming edition of the Astronomical Journal. Star clusters across the universe come in two types: globular clusters, which are home to hundreds of thousands of gravitationally bound and very ancient stars, many of them nearly 10 billion years old; and open star clusters, which are normally very young and contain only a few hundred stars. NGC 6496 is a globular cluster. According to study team member Andrea Kunder of CTIO, such clusters are "some of the most interesting objects in the Milky Way, because they are so old, and also because they are some of the few visible objects in the galactic halo." The galactic halo extends beyond the visible part of a galaxy and is composed mainly of dark matter, which cannot be observed directly, researchers said. "Just like archaeologists use fossils to reconstruct the history of the Earth, astronomers use globular clusters to reconstruct the history of the galaxy," Kunder said. "There are only about 150 globular clusters known in the Milky Way Galaxy, so each of these globular clusters is an important tracer of the galactic halo and the formation of the Milky Way Galaxy." NGC 6496 lies on the other side of Milky Way's center, so when you look at it from Earth, you have to peer through a lot of gas and dust. That is why during previous ground-based observations it was tricky to measure with certainty its basic parameters, such as its distance from the Earth and precise age, said study team member Luciano Fraga from the National Astrophysics Laboratory (LNA) in Brazil. In 2003 the cluster had been studied with the Hubble Space Telescope, and the new observations using SAM have made it possible to improve the original measurements. It took a decade to develop and build SAM, at a cost of $4.5 million. And on its very first use it already helped to improve the image quality from observations. "Quite honestly, this cluster was chosen because it was visible in the night sky when SAM was being commissioned. We needed a target to observe, and this cluster was up at the right time. We also knew that it hadn't been studied very extensively, so we thought we could contribute to a further understanding of the properties of this cluster," Kunder said. Globular cluster NGC 6496 observed with SAM. The image is about 3 arc minutes across. The enlarged sections of the cluster show the image with SOAR adaptive optics (AO) on and off. SAM is a type of a Laser Guide Star (LSG) – a powerful laser that creates an artificial star in the night sky. It is used as a reference star to help astronomers get a better image of the celestial object they wish to observe. Most skywatchers are likely used to seeing stars twinkle. That twinkling appears because of the turbulence of the Earth's atmosphere. The atmospheric interference can make the image of a distant celestial object eyed with a ground-based telescope blurry. This fuzziness is especially unwelcome when looking at star clusters, where stars are close together and several stars may appear as one big one. But natural stars are not always available to act as a reference. According to astronomers only about 1 percent of stars are bright enough to be used for adaptive optics. So in the vast majority of cases, they need to create a star from scratch — by using lasers. However, the wavelength of the laser has to be close to the wavelength observed by the telescope. On some major telescopes, such as the Very Large Telescope (VLT) at Paranal Observatory in Chile, astronomers use a powerful near-infrared laser to create guide stars at an altitude of about 90km, which allows them to make observations in the infrared range. SAM, the new instrument, shoots an ultraviolet laser to the "ground layer" of the atmosphere at about 10km above sea level. That helps to guide the adaptive optics of telescopes working at visible wavelength. It is also cheaper to use, and covers a wider field of view (3 arc minutes). Kunder said with its sharper images, the system made it possible to see that objects previously appearing as single bright stars were actually groups of two, three or even four stars. "Stars that were otherwise compromised by light smearing out from the atmosphere were sharpened, allowing us to observe more stars with better precision," she added. "We could therefore peer into the heart of the cluster without worrying about the smearing out of light from the high density of stars in the very center of the cluster." Editor's Note: This story was updated to correct an error in a press release describing the technology. The instrument is located at the Southern Astrophysical Research (SOAR) telescope, not the Southern Observatory for Astrophysical Research (SOAR), as was orignally stated.